The seven nations affected by a new executive order that prevents many of their citizens from entering the United States for the next 90 days accounted for 904,415 legal U.S. entries between fiscal years 2006 and 2015. This group includes visitors, students and diplomats as well as refugees and new lawful permanent residents, according to a Pew Research Center analysis of government data. The order, signed by President Donald Trump on Jan. 27, specified that most citizens from Iran, Iraq, Libya, Somalia, Sudan, Syria and Yemen could not enter the U.S. until security procedures used to evaluate visa applications have been reviewed. (Diplomats and those traveling with visas for government officials are exempt from the ban.) The president’s new order also temporarily halted the U.S. refugee resettlement program for 120 days and indefinitely banned most Syrian refugees. Prior to the executive order, citizens of the seven restricted countries were able to legally enter the U.S. in several ways. Official data are available on three categories of legal entrants: temporary immigrants, refugees and new lawful permanent residents. Government data are unavailable for those who entered as naturalized U.S. citizens, dual nationals (citizens of any two countries) or U.S. lawful permanent residents after their first entry into the U.S. It remains unclear how the executive order may impact their entry into the United States. Over the same period, annual refugee admissions from these seven countries almost doubled, from 15,237 in fiscal 2006 to 27,919 in 2015, according to U.S. State Department data. The annual total jumped to 36,722 in fiscal 2016, a year when 12,587 refugees were admitted from Syria alone. In all, 235,968 refugees from these seven countries were admitted between fiscal years 2006 and 2015, representing nearly four-in-ten (38%) of all refugee admissions during the period. 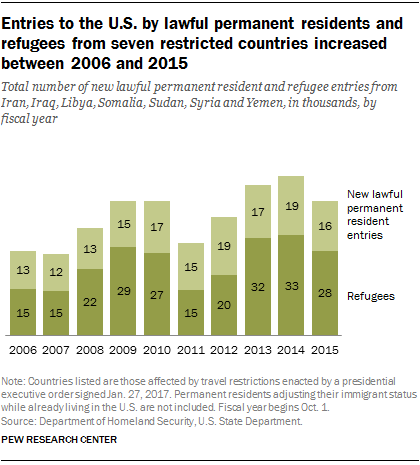 The annual number of new lawful permanent residents entering from Iran, Iraq, Libya, Somalia, Sudan, Syria and Yemen also increased between fiscal years 2006 and 2015, from 12,594 to 16,103 arrivals. This is a group that can include family members of U.S. citizens, special immigrants like Iraqi translators, and awardees of the diversity immigrant visa program. In all, 157,626 people entered the U.S. between 2006 and 2015 as new lawful permanent residents from these seven nations, with nearly half (44%) from Iran. Of the seven restricted countries, Iran had the largest total number of legal entrants into the U.S. (310,182) between 2006 and 2015. Two-thirds (67%) of these entrants arrived in the U.S. on temporary visas. Iraq had the second highest number of entrants (254,483). However, nearly half (49%) arrived as refugees, compared with 40% who entered as temporary immigrants. Between 2006 and 2015, most of Syria’s 124,708 legal entrants to the U.S. (85%) held temporary visas (refugees from Syria did not start to enter the U.S. in large numbers until fiscal 2016). Meanwhile, 86% of Somalia’s 72,652 entrants during this time were refugees. Yemen (56,455 entries), Sudan (52,287) and Libya (33,648) had far fewer entries between fiscal years 2006 and 2015 than the other restricted countries. In all three countries, the majorities of entrants entered as temporary visa holders.